There is no shortage of articles discussing Kombucha health benefits, often without sources or references. I see these and wonder how much is made up on the spot, or misinterpreted. Fake news is a thing, and so is pseudoscience. I needed to conduct my own research and studies. Could I find peer-reviewed studies, with methodologies published? What have I been drinking the past year? Is Kombucha actually healthy for you? Will it bring eternal youth? What’s the meaning of life? 42. Okay, with the easy question out of the way, let’s dive in. Grab a fresh glass of kombucha and let’s go. I’m not a doctor and none of this should be taken as medical device. I have no prior education in the medical or chemistry fields. Or really anything related to this. I did a lot of googling and dumbing down of words and concepts I didn’t understand, and quite possibly still don’t. I included sources so you can be skeptical of me, too. Please correct me or provide supplemental information in the comments below. Ads: There are some affiliate links to products you can buy. I receive a commission when you buy these. The cost is the same to you. While tea originated in China over 5000 years ago , Kombucha didn’t come about until much later, around 220BC, also in China, during the Tsin Dynasty. At this time it was referred to as the Divine Che, or Ling-tche. Several hundred years later, it was introduced to Korea and Japan by Doctor Kombu . As trade routes expanded, Kombucha was brought to Russia and then Europe. Up until WWII, the drinking of fermented tea or Kombucha was widely acceptable until rationing of sugar and tea brought about widespread shortages. During its entire history, Kombucha had been consistently called upon as having magical properties, a cure-all, digestive aid, plenty of other healing benefits. Scientific research regarding the health benefits of Kombucha began around 1917-1918 and really expanded during the 1950’s. Scientifically speaking, a Kombucha colony/mat/SCOBY represents a symbiotic relationship between bacteria and yeasts . You’ll find a lot of folks simply citing SCOBY, which stands for Symbiotic Culture Of Bacteria and Yeast. Essentially the same as the scientific definition. The Kombucha tea itself is a minimally carbonated, acidic tea made of sugars, organic acids, tea components, vitamins, and minerals. Poured into an unsuspecting person’s glass, it looks like cider and smells like Apple Cider Vinegar, sometimes fruity, depending on the tea used. Chemical analysis of Kombucha tea shows the presence of various organic acids, such as acetic, gluconic, glucuronic, citric, L-lactic, malic, tartaric, malonic, oxalic, succinic, pyruvic, usnic; also sugars, such as sucrose, glucose, and fructose; the vitamins B1, B2, B6, B12, and C; 14 amino acids, biogenic amines, purines, pigments, lipids, proteins, some hydrolytic enzymes, ethanol, anti-biotically active matter, carbon dioxide, phenol, as well as some tea polyphenols, minerals, anions, DSL, as well as insufficiently known products of yeast and bacterial metabolites . If you’ve ever picked up a SCOBY, you’ll note it has a slimy wet gelatinous texture. Ever wondered what holds all of that together? Prepare to gross yourself out. I picked up my own set of SCOBYs, read the below, then licked my fingers. Kidding. Or am I? The primary bacterium in the SCOBY is Acetobacter xylinum , as well as Acetobacter sp. (NRRL B-2357) . One researcher, Hesseltine, found both Pichia and Zygosaccharomyces (NRRL Y-4810 and 4882) yeasts inside of Kombucha . A second researcher, Mayser et al., based out of Germany, was able to demonstrate the yeast composition of the SCOBY is highly variable; but that Brettanomyces, Zygosaccharomyces and Saccharomyces occurred most frequently in the samples studied . Roussin, based out of North America determined that the typical Kombucha SCOBY microorganisms were Acetobacter xylinum, Zygosaccharomyces, and Saccharomyces cerevisiae . A broad spectrum of yeasts has been reported including species of Saccharomyces, Saccharomycodes, Schizosaccharomyces, Zygosaccharomyces, Brettanomyces/Dekkera, Candida, Torulospora, Koleckera, Pichia, Mycotorula, and Mycoderma. The yeasts of Saccharomyces species were identified as Saccharomyces sp. (Konovalov and others 1959; Kozaki and others 1972) and as Saccharomyces cerevisiae (Herrera and Calderon-Villagomez 1989; Liu and others 1996; Markov and others 2001; Safak and others 2002), Saccharomyces bisporus (Markov and others 2001), Saccharomycoides ludwigii (Reiss 1987; Markov and others 2001; Ramadani and Abulreesh 2010), Schizosaccharomyces pombe (Reiss 1987; Teoh and others 2004), Zygosaccharomyces sp. (Sievers and others 1995; Markov and others 2001; Marsh and others 2014), Zygosaccharomyces rouxii (Herrera and Calderon-Villagomez 1989), and Zygosaccharomyces bailii (Herrera and Calderon-Villagomez 1989; Liu and others 1996; Jayabalan and others 2008b). The genus Brettanomyces was isolated by several workers. Herrera and Calderon Villagomez (1989) isolated Brettanomyces intermedius, Liu and others (1996) and Teoh and others (2004) isolated Brettanomyces bruxellensis, and Jayabalan and others (2008b) isolated B. claussenii. An examination of 2 commercial kombucha and 32 cultures from private households in Germany (Mayser and others 1995) showed variable compositions of yeasts. The predominant yeasts were Brettanomyces, Zygosaccharomyces, and Saccharomyces spp. Roussin (1996) determined Zygosaccharomyces and S. cerevisiae as the typical yeasts in North American kombucha. Kurtzman and others (2001) isolated an ascosporogenous yeast, Zygosaccharomyces kombuchaensis sp. n. (type strain NRRL YB-4811, CBS 8849), from kombucha. An investigation of the physiology of Z. kombuchaensis sp. n., related to the spoilage yeasts Zygosaccharomyces lentus, clearly showed that these 2 species were not same (Steels and others 2002). Candida sp. is included in a great number of kombucha beverages. Kozaki and others (1972) isolated Candida famata, Candida guilliermondii, and Candida obutsa. In kombucha samples from Mexico, Herrera and Calderon-Villagomez (1989) detected C. famata. Teoh and others (2004) identified Candida stellata. From a local kombucha in Saudi Arabia, Ramadani and Abulreesh (2010) isolated and identified 4 yeasts: Candida guilliermondi, Candida colleculosa, Candida kefyr, and Candida krusei. C. krusei were identified in kombucha from a district of Ankara (Turkey; Safak and others 2002). The presence of the following was also established: Torula (Reiss 1987), Torulopsis (Konovalov and others 1959; Herrera and Calderon-Villagomez 1989; Markov and others 2001), Torulaspora delbrueckii (Teoh and others 2004), Mycotorula (Konovalov and others 1959), Mycoderma (Konovalov and others 1959; Reiss 1987), Pichia (Reiss 1987), Pichia membranefaciens (Kozaki and others 1972; Herrera and Calderon-Villagomez 1989), Kloeckera apiculata (Danielova 1954; Kozaki and others 1972; Safak and others 2002), and Kluyveromyces africanus (Safak and others 2002). Mayser et al. 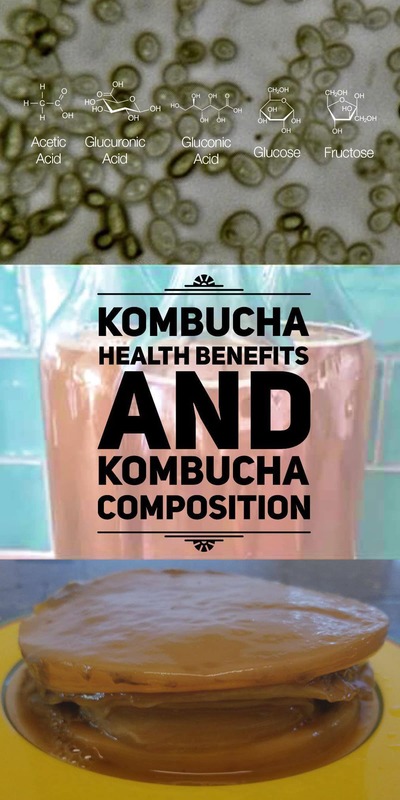 consistently measured a low rate of contamination from harmful microorganisms (spoilage and pathogenic) and concluded that Kombucha can safely be prepared at home without pathogenic health risk . Yokihiko and Watanabe  found that Clostridium botulinum spores were killed when inoculated into Kombucha. Reports of severe illness following the human consumption of Kombucha have all been debunked by other causes, such as outside sources of lead poisoning (use of pots or drinkware such as pottery which contained lead) or unhygienic conditions. The anti-microbial activity observed in Kombucha samples containing 33 g/L total acid (7 g/L acetic acid) was significant against the tested gram positive and gram negative pathogenic organisms. Kombucha tea demonstrated no anti-microbial properties. The contribution of tea itself to the anti-microbial activity of Kombucha proved to be insignificant in the tested organisms, even at the highest levels of acetic acid tested . As a result, the anti-microbial activity of Kombucha was from the acetic acid composition. These findings were consistent with both green and black tea combinations. . In simpler terms, the anti-microbial effect of Kombucha comes from the vinegar (acetic acid). If you’re drinking Kombucha just for anti-microbial health benefits, you’re just as good to keep drinking that Apple Cider Vinegar. Kombucha’s antioxidant effects are correlated with many claimed beneficial effects like preventing cancer, boosting the immune system, anti-inflammation and reducing arthritis. Jayabalan and others (2008a) reported on the free radical scavenging abilities of kombucha tea prepared from green tea, black tea, and tea waste material . Kombucha made with green tea and Kombucha with high levels of acetic acid (vinegar) and the Zygosaccharomyces sp. bacteria in black tea was shown to have higher levels of antioxidant activity and free radical scavenging effects. Most of the studies regarding the effects of Kombucha as a liver hepatoprotective agent concluded that kombucha tea could be beneficial against liver diseases, for which oxidative stress is a well-known causative factor . While the amount of Kombucha, levels, etc, was not the same across multiple studies, it was found that black tea based Kombucha could effectively reduce the physiological changes driven by liver toxins. Other studies  showed that hepatoprotective (prevention of damage to the liver) properties of Kombucha against TBHP (tert-butyl hydroperoxide), which has to do with nonalcoholic fatty liver disease and toxic liver injury. Green and black tea consumption has been shown to significantly reduce the blood glucose level of aged rates. The tea polyphenolics inhibits alpha-amylase activity in saliva and reduces the intestinal amylase activity (breaking down of starch to simple sugars) which in turn lowers the hydrolysis of starch to glucose and reduces glucose assimilation. Tea polyphenols also protect against oxidative stress associated with late complications in diabetes pathology and are useful to maintain a balance between pro- and anti-oxidants in the organism. Fermented tea, or Kombucha, has not been shown to display a significant difference compared with non-fermented tea . Kombucha has been reported as having anti-cancer properties since the 1950’s, starting with a report by the Russian Academy of Sciences in Moscow (1951). I’ve always been a skeptic of any sort of fermented or natural remedy being reported as anti-cancer, so I was particularly intrigued by these studies and findings. While pleasantly surprised by the results, I want to importantly note that you should NOT take away from this that simply drinking Kombucha will cure your cancer. It won’t. Please keep seeing your appropriate doctor. The anti-cancer properties of Kombucha which are accepted by most researchers include the inhibition of gene mutation, inhibition of cancer-cell proliferation, the induction of cancer-cell apoptosis, and the termination of metastasis   . Aspects of Kombucha which contribute to anti-cancer properties are reported to be due to tea polyphenols (catechins, theaflavins, tannins, and flavonoids) and their degradation products formed during the fermentation process. Recent studies  on Kombucha’s effects with breast adenocarcinoma (breast cancer) and colon adenocarcinoma (colon cancer) tested both black tea and winter savory (Satureja montana) teas, with winter savory Kombucha having more active components of antiproliferative than tea made with winter savory, and comparable of black tea Kombucha. Another cancer study  looked at Kombucha made with black tea and found it significantly reduced cell invasion and cell motility in human renal carcinoma (kidney cancer) and human osteosarcoma (bone cancer). Black tea kombucha also reduced the activities of matrix metalloproteinase-2, which is associated with cancer cell invasion and chronic airway diseases. A study on Lyophilized kombucha tea extract  demonstrated a significant decrease in the survival of prostate cancer cells. The Kombucha extract showed great potential in inhibiting angiogenesis through alterations in the expression of angiogenic stimulators. I tried to figure out what exactly that means and still don’t get it. Motivated to dive in and make your own Kombucha? I’ve got you covered with Kombucha Brewing Equipment and Basics. Reiss, J. Influence of different sugars on the metabolism of the tea fungus. Zeitschrift fuer Lebensmittel Untersuchung und Forschung, 198, 128-261 (1994). Mayser, P., Fromme, S., Leitzmann, C., and K. Gruender. The yeast apectrum of the ‘tea fungus Kombucha.’ Mycoses, 38 (7-8), 289-295 (1995). Hesseltine, C.W. A millennium of fungi, food and fermentation. Mycologia, 57, 149-197 (1965). Roussin, M.R. Analysies of Kombucha Ferments: Report on Growers. Salt Lake City, UT: Information Resources, LC (1996). Steinkraus, K.H., K.B. Shapiro, J.H. Hotchkiss, R.P. Mortlock. Examinations on Antibiotic Activity of Tea Fungus/Kombucha Beverage. Acta Biotechnologica, 16 (2-3), 199-205 (1996). Yokihiko, H. and M. Watanabe. Antibacterial activity of tea polyphenols against Clostridium botulinum. Journal Japanese Society of Food Science and Technology, 36 (12), 951-955 (1989). Jayabalan, R., Malbasa, R. V., Loncar, E. S., Vitas, J. S., Sathishkumar, M. (2014). A review on kombucha tea – microbiology, composition, fermentation, beneficial effects, toxicity, and tea fungus. Comp. Rev. Food Sci. Food Safety, 13, 538–550. Pauline T, Dipti P, Anju B, Kavimani S, Sharma SK, Kain AK, Sarada SK, Sairam M, Ilavazhagan G, Devendra K, Selvamurthy W. 2001. Studies on toxicity, anti-stress and hepato-protective properties of kombucha tea. Biomed Environ Sci 14:207–13. Bhattacharya S, Gachhui R, Sil PC: Hepatoprotective properties of kombucha tea against TBHP-induced oxidative stress via suppression of mitochondria dependent apoptosis. Pathophysiology. 2011, 18 (3): 221-234. 10.1016/j.pathophys.2011.02.001. Cetojevic-Simin DD, Bogdanovic GM, Cvetkovic DD, Velicanski AS. 2008. ´ Antiproliferative and antimicrobial activity of traditional kombucha and Satureja montana L. Kombucha. J BUON 133:395–401. Jayabalan R, Chen PN, Hsieh YS, Prabhakaran K, Pitchai P, Marimuthu S, Thangaraj P, Swaminathan K, Yun SE. 2011. Effect of solvent fractions of kombucha tea on viability and invasiveness of cancer cells—characterization of dimethyl 2-(2-hydroxy-2-methoxypropylidine) malonate and vitexin. Indian J Biotechnol 10:75–82. Srihari T, Arunkumar R, Arunakaran J, Satyanarayana U. 2013a. Downregulation of signalling molecules involved in angiogenesis of prostate cancer cell line (PC-3) by kombucha (lyophilized). Biomed Prev Nutrit 3:53–8. Conney AH, Lu YP, Lou YR, Huang MT. 2002. Inhibitory effects of tea and caffeine on UV-induced carcinogenesis: relationship to enhanced apoptosis and decreased tissue fat. Eur J Cancer Prev 2:28–36. Ioannides C, Yoxall V. 2003. Antimutagenic activity of tea: role of polyphenols. Curr Opin Clin Nutr Metab Care 6:649–56. Park AM, Dong Z. 2003. Signal transduction pathways: targets for green and black tea polyphenols. J Biochem Mol Biol 6:66–77. Balentine, D. A., Wiseman, S. A., & Bouwens, L. C. (1997). The chemistry of tea flavonoids. Critical Reviews in Food Science and Nutrition, 37, 693±704. Roche, J. (1998) The history and spread of Kombucha. http:// w3.trib.comkombu/roche.html. Yang, T. T. C., & Koo, M. W. L. (1997). Hypocholesterolemic eects of Chinese tea. Pharmacological Research, 35, 505±512. Yokozawa, T., Dong, E., Chung, H. Y., Oura, H., & Nakagawa, H. (1997). Inhibitory eect of green tea on injury to a cultured renal epithelium cell line, LLC-PK. Bioscience, Biotechnology and Biochemistry, 61, 204±206. Dufresne C, Farnworth E. 2000. Tea, kombucha, and health: a review. Food Res Int 33:409–21. Thank you for this! I have never tried kombucha, but I have heard so much about it. This is finally all the questions I have had answered. There are so many great health benefits.